Meet our most recent Featured Library Employee for the Missouri Library Association, Jim Coombs! 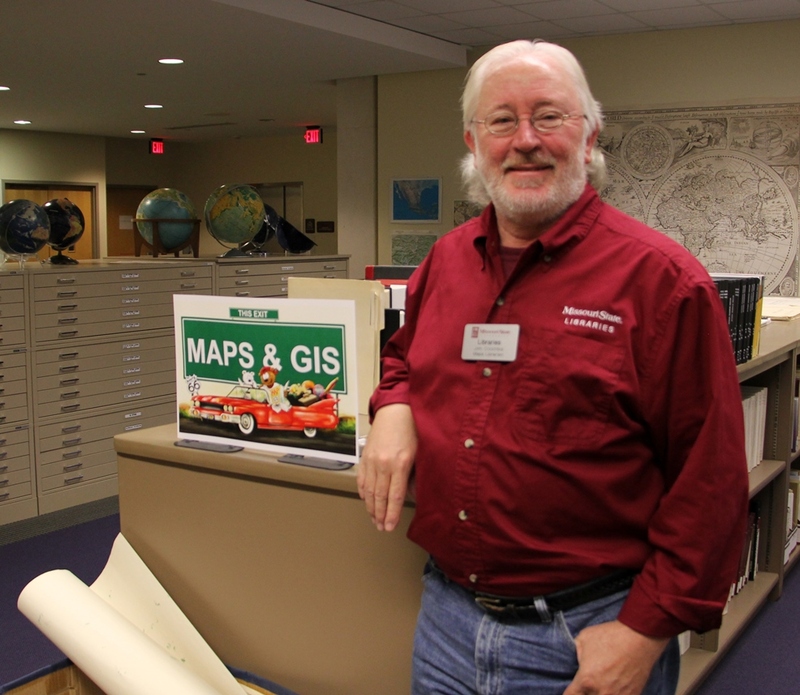 I majored in geography as an undergraduate at Ball State University and used the map library’s resources. I decided that working in a map library would be the perfect job for me. The reference service is my favorite part of library work. Also, I get to draw maps for professors’ books! Keeping up with the changes in computer mapping. Yes, in my computer mapping work, I’m curious about the accuracy of the source data I use. David Cobb, who was Map Librarian at the University of Illinois when I had a 2-year internship there in 1978-80. It was my first professional library job after getting my Master’s in Map Librarianship and he taught and showed me how to manage a map library. Brook Blevins’ three volume A History of the Ozarks offers a comprehensive history of the region. The first volume came out in summer 2018. Blevins tries to write history books that connect with common folks. He wants people in the Ozarks to know they have a valuable regional history of their own and take pride in it. I went to China in 1985 as the only Maps & GIS specialist in an ALA delegation of 50 librarians. We toured libraries in Beijing, Xian, Chengdu and Shanghai. We also toured the Great Wall, the Forbidden City, and the buried army of terra cotta soldiers. It’s very hard to describe what we experienced compared to life in China today. Back then, there was a heavy military presence and we experienced travel delays while they scrutinized our documents. We were stared at as the first Caucasian people the Chinese had seen. The only people who had cars were military and Government officials. Everyone else rode bicycles or walked. I described the experience as “I might as well have gone to Mars, because everything in the Chinese cultural experience was so completely different from what I grew up with in the U.S.” I still cherish the experience. 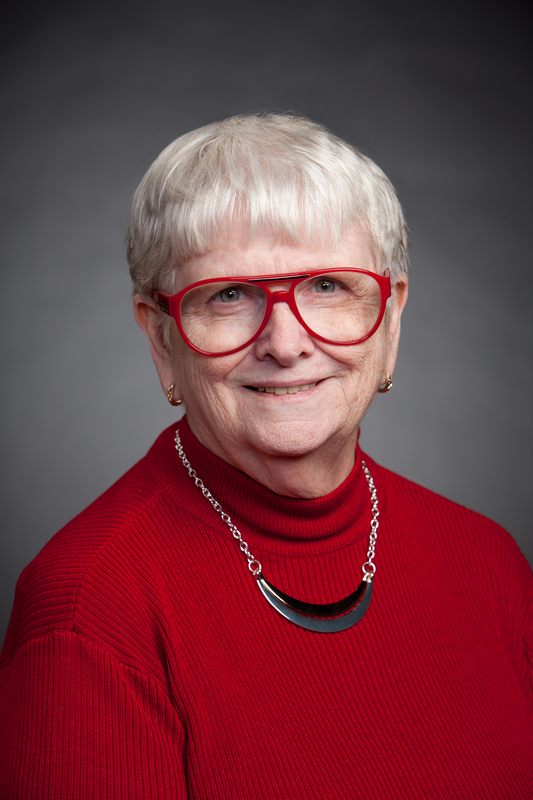 Meet our most recent Featured Library Employee for the Missouri Library Association, Peggy Ridlen! It was my love of reading as a child that initiated my interest in working at a library. I did not learn to read until I was 8 years old. * However, when I did, a whole new world erupted. I have the best job in the world! Academic librarianship provides a purposeful life suited to my abilities and personality. 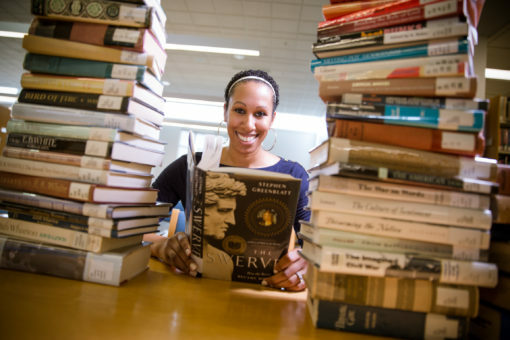 The mission, values, vision, commitment and students of Fontbonne University foster the opportunity to impart the value of libraries and literacy to the next generation. Ongoing student engagement in raising awareness of intellectual freedom and the importance of information literacy in an increasingly digital world. The short answer to this question is EVERYTHING. Working in a resource rich environment naturally enhances intellectual curiosity. Specifically, my work in higher education has made me realize the importance of MLA advocacy for libraries. My mother who collaborated with my 3rd grade teacher, Mrs. Stanley to teach me how to read. My Own Words; Ruth Bader Ginsburg is a great book about a great woman who has done great things! Most people do not realize the influential role this iconic supreme court justice played as a young lawyer to advance equal opportunities for women in the US. *If it weren’t for access to public and school libraries with fantastic librarians, I probably still wouldn’t know how to read! 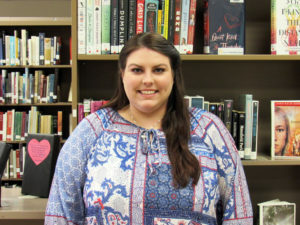 Meet our most recent Featured Library Employee for the Missouri Library Association, Jennifer Gravley! 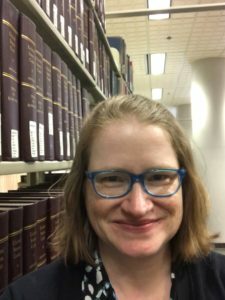 I’m Jennifer Gravley, and I’m currently a temporary Research and Instruction Librarian at Ellis Library and a part-time Evening/Weekend Library Supervisor & Tutor at Stephens Library. I went to library school a little later in life than most, but it seemed a good fit with my creative writing background and experience in scholarly publishing. There’s not a time in my life I don’t remember libraries playing a major role. I have always relied on libraries to provide me with access to books, both the ones I wanted to read and the ones I didn’t want to read or didn’t know I wanted to read. Libraries make writers. Unfinished projects! And the chance to help students have good experiences in the library that will make libraries a permanent part of their lives as well. I think knowing you can always do more is a personal and professional challenge. I think everyone who works in a library figures out where that line is of pushing toward that “enough” that’s never attainable while settling for an “enough” that preserves the time and space to live a fully engaged life outside of the library. Working in academic libraries means being surrounded by people pursuing their own intellectual interests and helping provide them with the information and tools to do so. Frankly, that reminds me to do my own work. I think academic librarians are most effective when they have the opportunity and support to be committed to their own intellectual pursuits that enrich the profession, the university, and the community at large. When you’re in a temporary or evening/weekend position, mentorship is much more informal as you are on a different path from other staff—or may not see much of them. That said, I learn so much from everyone I work with. If you listen and observe, you can’t help but learn. Beyond the particulars of the professional work, what I have most admired about my colleagues and hope to emulate is their dedication to lifting each other up and supporting each other’s work. So much in libraries depends on collaboration. I’m going to recommend Santa Clarita Diet. Season 2 of this zombie comedy was especially delightful. Trust me when I say you’ll find some relationship goals in Shelia and Joel. I’ll throw in a plug for my fabulous local public library. The Columbia Public Library was the first thing I loved about Columbia. To this day, the more time I spend in libraries as a patron, the more human I feel. 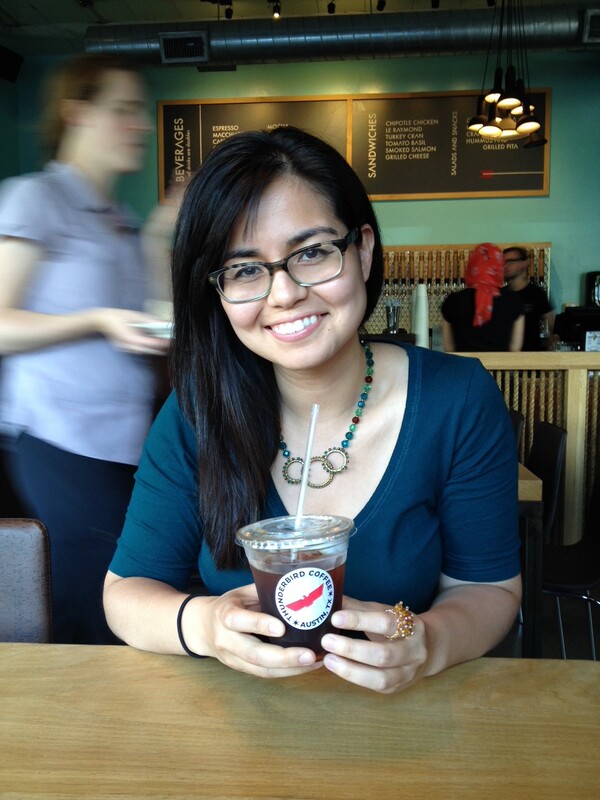 Meet our most recent Featured Library Employee for the Missouri Library Association, Kelsey Fitzgerald! My interest in libraries was piqued as a child. I couldn’t believe that there were entire buildings devoted to books. As I grew older, I realized all that libraries have to offer. I worked for a summer in my university library at Baylor University and that was when the wheels really started turning about making this a career. I wanted to combine my love of books, education, volunteerism, and children and the perfect way to do that was to become a youth librarian. The families in the communities I serve keep me coming back every day. It is an amazing feeling when I see a child’s face light up while reading a book or participating in one of my programs. My favorite part is seeing a shy or withdrawn child become more comfortable and start openly enjoying all of the wonders of the library. The library is an amazing place for families to connect with others for entertainment, education, and support. Another aspect of my job that keeps me coming back is the people that I work with at Ozark Regional Library and our shared desire to support the small, rural communities in which we live. The library is a staple of the community and we want to offer the very best resources possible. Combined with their desire to serve, my co-workers are kind, dedicated, and always good for a laugh. One of the biggest challenges I face is getting children and their families into the library. Ozark Regional Library has four branches in small, rural communities and it is my responsibility to bring children and teen programs to all of them. Transportation and time are the biggest obstacles in getting families through the library doors. To help combat this, my co-workers and I offer programs in the local schools and daycares, and at community events. Our library has developed strong collaborations with community groups, schools, extension offices, media and more to ensure that we reach as many people in our community as possible. My work has made me passionate about collection development. 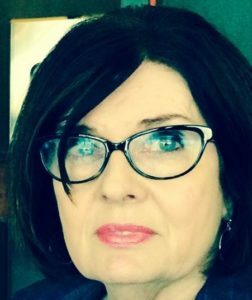 My Library Director, Holly Martin Huffman, strives to have a collection of the very best materials and resources that will foster knowledge, imagination, and growth. I am thrilled that I share some of the responsibility in developing the collections for children and teens. My passion for collection development led to an amazing opportunity for me to serve on the Missouri Association of School Librarian’s Truman Readers Award Committee. My participation on this committee has exposed me to hundreds of books for students in grades 6-8 and has introduced me to astounding school librarians that I may not have had the opportunity to work with otherwise. If you’re not familiar with MASL’s Readers Award lists, I recommend checking them out because a great deal of hard work and dedication goes into making those lists by school librarians, public librarians, and students. I have been blessed to have worked with extraordinary people in all of the libraries in which I have served. The staff at Smith Public Library in Wylie, Texas, where I held my first youth department position, helped me get a strong start in this career. 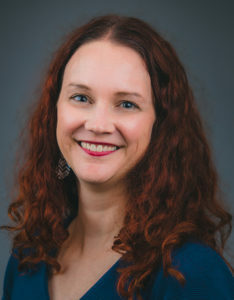 One particular individual that helped me get out of my comfort zone is Jennifer Ilardi, Youth Librarian at St. Louis County Library-Florissant Valley. I had the pleasure of working alongside her for the better part of a year and I loved how she challenged me and how her passion for youth services was contagious. With my involvement in the MASL Truman Committee, I don’t have much time for TV, but I do read at least two books a week. However, I don’t want to give any hints as to what might end up on that list, so I’ll just say that there have been some really good books published recently. Personally, the book that keeps me constantly engaged is the Bible. I read it every day and believe it is the best book ever written. The Bible offers encouragement, courage, guidance, and truth. Never underestimate the effect that libraries and library staff can have on a person’s life, especially the life of a child.